Please note: These select Vision Plans can be viewed online, but at a reduced quality and without supplemental inserts. To purchase these or other Vision Plans in their high-quality entirety please contact the Design Center. You are welcome to come by the Design Center and look at hard copies of any of our publications! 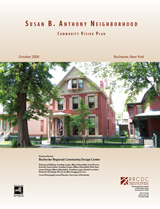 Vision Plans are the final output of a community driven process facilitated by the Community Design Center Rochester. This report chronicles development of the vision plan and provides a record of community ideas generated throughout the process. The ECRA Steering Committee, with assistance from CDCR, used these ideas to create a vision for redevelopment of the neighborhood. Each section of the report explores a different aspect of the study area or the process involved in creating and implementing this vision. The vision plan is intended as a resource for members of the community as well as other individuals and organizations interested in developing or improving properties in the neighborhood. The vision planning process produces a document that sets forth the intentions of a neighborhood’s residents for the future of its public realm. Without it, even well-intentioned development efforts might not align with the goals and desires of the existing residents. With it, development can help the community reach their goals and contribute to a vibrant neighborhood for everyone. People who live and work in ECRA can see great potential for this community. As the future unfolds, they and many others will work to help these visionary ideas become reality. The community hopes all who read this plan will do their part to bring these visions to life in the El Camino Revitalization Area, for the benefit of all who visit or live in the neighborhood and the city of Rochester. 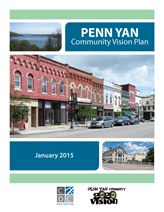 The Penn Yan Community Vision Plan was produced by the Community Design Center of Rochester (CDCR) with input and participation from the Vision 20/20 Steering Committee as well as Penn Yan residents, business owners, and other stakeholders. The Plan addresses the unique needs and desires of the Penn Yan community in the form of visual maps, images and text. It reflects the community’s collective vision for Penn Yan over the next 20-30 years. Vision Plan are explained verbally and, as often as possible, represented visually to demonstrate how the results of the suggested action might materialize. 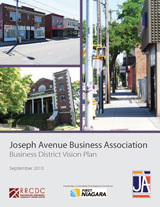 In collaboration with the Joseph Avenue Business Association (JABA), the Community Design Center has prepared this community-based Vision Plan for the Joseph Avenue Business District. The Business District boundaries extend from Wilkins Street on the south to Pardee Street on the north. 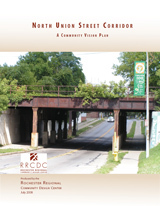 This document reflects the ideas that the community has for the revitalization and enhancement of the corridor. develop guiding principles for the final plan. In collaboration with the Lima Steering Committee, CDCR prepared this community-based Vision Plan for the Route 15A corridor between the village and town line. 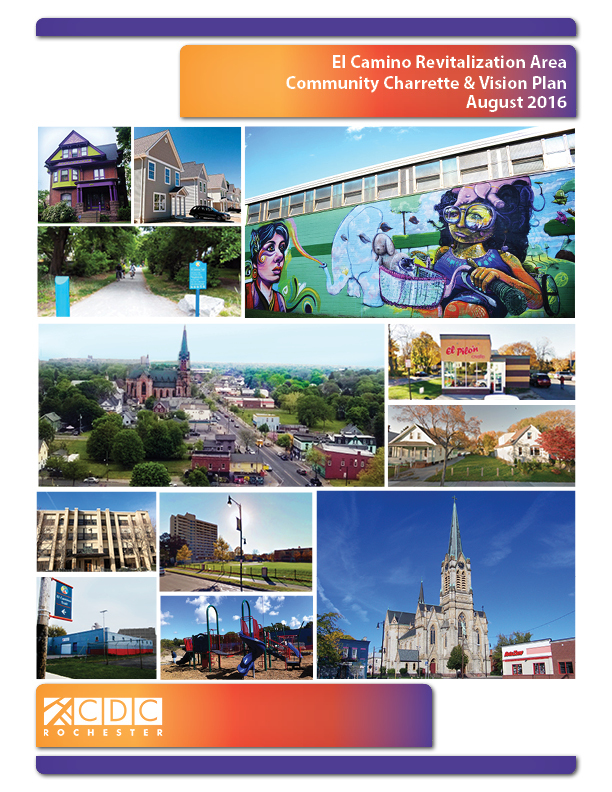 This document reflects the ideas that the community has for the revitalization and enhancement of the corridor. used to develop guiding principles for the final plan. 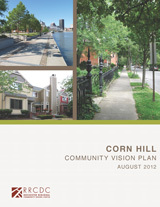 IA community-based “Vision Plan” for the Corn Hill neighborhood was prepared by the CDCR in collaboration with the Corn Hill Neighborhood Charrette Steering Committee. The pages reflect the goals and ideas of community members for revitalization and enhancement of their neighborhood, the commercial district and the underdeveloped and underutilized areas surrounding the district, including the riverfront. the enhancement of the public realm and the creation of a well-connected, pedestrian-friendly community. In January 2007, the CDCR coordinated and facilitated a three-day professional design charrette for Center City Rochester which was held at Midtown Plaza in downtown Rochester. The charrette built on previous work including the 2000 Rochester Downtown Design Charrette, the 2004 Center City Master plan, and work done by the Urban Land Institute in 2005. The purpose was: 1) to generate ideas for the development of strategic sites in 5 geographic focus areas in the downtown, 2) to identify guiding principles as a design approach to revitalization of the built environment in the downtown, 3) to create a Center City Vision Plan to help guide future projects in the downtown, 4) to create an environment for economic rejuvenation and sustainable development in the downtown. Partners and participants included the Rochester Downtown Development Corporation (RDDC); AIA Rochester Chapter; representative from the city and county; 138 local design professionals; resource teams made up of community leaders and stakeholders; and citizens who were invited to share their ideas. During the course of the year following, five design teams and approximately 55 design professionals, worked to refine plans and design schemes for sites in their focus areas. 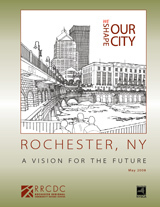 The CDCR team worked on the overall issues related to items like circulation, connectivity, public realm improvements and green space and assembled this report document, "Rochester, NY, A Vision for the Future." It is intended that the report and drawings produced serve as a basis for and are integrated into a strategic plan to be taken forward. IIn collaboration with the Marketview Heights Steering Committee, comprised of residents from the Marketview Heights neighborhood, Rural Opportunities, Inc., and Housing Opportunities, Inc., the CDCR prepared this community-based vision plan for the North Union Street Corridor from East Main Street to Central Park. The document serves to provide a written and visual urban design vision reflecting the goals and ideas of community members for revitalization of their neighborhood and the corridor. This report incorporates ideas suggested by nearly 40 residents and stakeholders at the Marketview Heights Mini-Charrette held at Dr. Freddie Thomas Learning Center in October 2007. The document expresses these ideas as elements of good design and planning to create a healthy, viable community, and as inspiration for the corridor’s future development. The mini-charrette was proposed as the first phase of implementing the Marketview Heights Neighborhood Revitalization Strategy which was completed in February 2006. 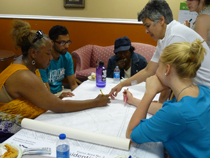 The formal planning process for the mimi-charrette event began in April 2007 and involved a steering committee comprised of diverse neighborhood stakeholders from the Marketview Heights Collective Action Project. Following the mini-charrette, the process of creating a vision for the North Union Street Corridor was carried out during late 2007 and early 2008.